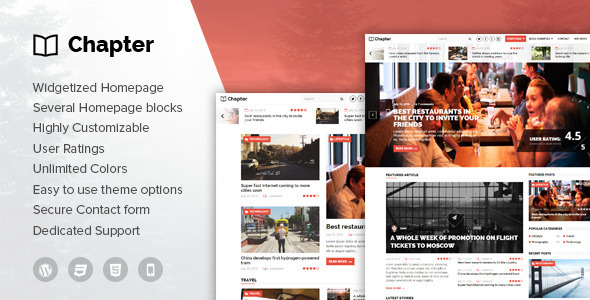 Chapter is a modern, clean, and responsive WordPress theme designed for magazine, news, and blog websites. The theme is packed with tons of features. It is highly flexible and enables you configure every detail and customize it according to your choice. The theme is incredibly easy set up and use. It comes with detailed documentation and awesome support. Chapter has been tested with browsers IE9, IE10, IE11, Firefox, Safari, Opera, Chrome.